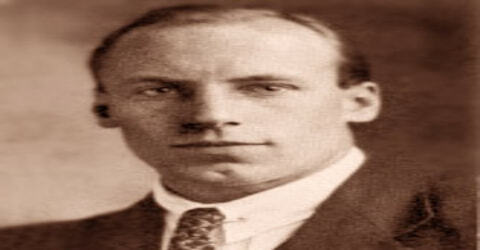 Eric Liddell – Scottish Olympic Gold Medalist runner, rugby union international player, and Christian missionary. 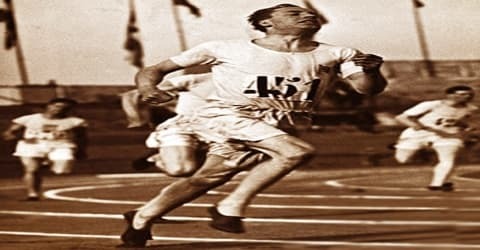 Eric Liddell, the British runner who won a gold medal in the 400-meter run and a bronze in the 200 meters at the 1924 Olympic Games in Paris, was born 16 January 1902, in Tientsin, China, the second son of the Reverend and Mrs. James Dunlop Liddell, Scottish missionaries with the London Missionary Society. He attended a boarding school near London, spending time when possible with his family in Edinburgh, and afterward attended the University of Edinburgh. Eric was known as a brilliant sportsman in his school and college. After learning Pure Science from University of Edinburgh and side by side taking part in races and rugby matches, Liddell ran in 400 meters at the 1924 Summer Olympics in Paris and made a world record in the process. But athletics was not the true calling of his life he left all the fame and glory to serve as a missionary in China, just like his parents. He became a schoolteacher there to teach and spread the word of God. Liddell was the one who sacrificed his life for the emancipation of China during its worst time the Japanese invasion of China in 1937. Liddell’s Olympic training and racing, and the religious convictions that influenced him are depicted in the Oscar-winning 1981 film Chariots of Fire, in which he is portrayed by fellow Scot Ian Charleson. Eric Liddell first gained national recognition by winning the 100- and 200-metre runs at the Amateur Athletic Association championships in 1923. At the 1924 Olympics, Liddell, a devout Christian, dropped out of the 100-meter run his strongest event because the final was scheduled for a Sunday. Instead, he trained for the 200- and 400-metre runs. At the Games, he finished third in the 200-meter run and turned in a remarkable performance to win the 400 meters. Starting in the outside lane, Liddell sprinted out of the blocks and set such a blistering pace that two racers stumbled trying to keep up. He won the race in a record time of 47.6 seconds. His life is an example of love, sacrifice, and true humanity, he lived for the gold far greater than the Olympics gold – the gold of being able to bring change into people’s lives. Eric Henry Liddell, fondly called the “Flying Scotsman,” was born on January 16, 1902, in Tientsin, north China to Reverend James Dunlop Liddell. His parents were Scottish missionaries with the London Missionary Society, stationed in China at the time he was born. Liddell went to school in China until the age of five. At the age of six, he and his eight-year-old brother Robert were enrolled in Eltham College, a boarding school in south London for the sons of missionaries. Their parents and sister Jenny returned to China. During the boys’ time at Eltham, their parents, sister, and new brother Ernest came home on furlough two or three times and were able to be together as a family, mainly living in Edinburgh. While he was studying at the Oxford College in England, stories of him being the fastest runner in Scotland started to do the rounds. He was seen as the potential Olympic winner. Not just a sportsman, Liddell was also a strongly principled Christian, which is why he was selected to speak at the Glasgow Students’ Evangelical Unit. In 1920, he enrolled himself at the University of Edinburgh to pursue Pure Science. 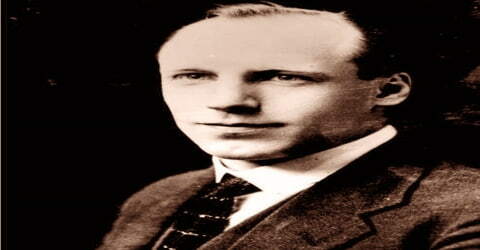 Liddell was chosen to speak for Glasgow Students’ Evangelical Union (GSEU) because he was so well known. The GSEU hoped that he would draw large crowds so that many people would hear the Gospel. The GSEU would send out a group of eight to 10 men to an area where they would stay with the local population. It was Liddell’s job to be the lead speaker and to evangelize the men of Scotland. Many came to see him because he was an accomplished athlete, but all heard his message of faith. In 1922 and 1923, Liddell played in seven out of eight Five Nations matches along with A. L. Gracie. In 1923 he won the AAA Championships in athletics in the 100-yard race (setting a British record of 9.7 seconds that would not be equalled for 23 years) and 220-yard race (21.6 seconds). He graduated with a Bachelor of Science degree after the Paris Olympiad in 1924. In 1934, after getting ordained a minister of religion, Eric Liddell got married to a Canadian missionary, Florence Mackenzie. Liddell courted his future wife by taking her for lunch to the famous Kiesling restaurant, which is still open in Tianjin. The couple had three daughters, Patricia, Heather and Maureen, the last of whom he would not live to see. The school where Liddell taught is still in use today. One of his daughters visited Tianjin in 1991 and presented the headmaster of the school with one of the medals that Liddell had won for athletics. Eric Liddell was triumphant in various British competitions, winning the shorter sprint distances at the Triangular International Contests from 1921-1923; the competition showcased athletes from Scotland, England, and Ireland. 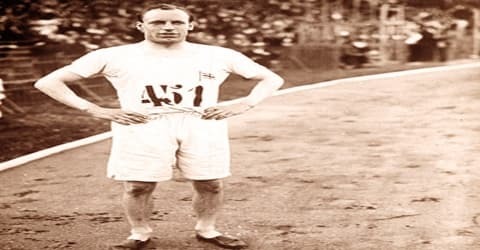 He was included in the British Olympic squad which was destined for the Olympics in Paris in 1924, and although he was a strong contender in the 100 meters event, due to his religious principles, Liddell refused to run on a Sunday. He refused to run in the 100m heats, which were held on a Sunday and instead became a member of the squad designated to run in 400 meters, a distance which he could handle very well, but it was certainly not his specialty. A great run won him not only a gold medal by a margin of some six meters, but also a world record of 47.6 seconds in the process was set. On the morning of the Olympic 400-meter final, July 11, 1924, Liddell was handed a folded square of paper, a gift from one of the team masseurs. Reading it later he found the message: “In the old book it says: ‘He that honors me I will honor.’ Wishing you the best of success always.” Recognizing the (slightly misquoted) reference to 1 Samuel 2:30, Liddell was profoundly moved that someone other than his coach believed in him and the stance he had taken. After the Olympics and his graduation, he returned to North China where he served as a missionary, like his parents, from 1925 to 1943. He first served in Tientsin (Tianjin) and later in Siaochang. Liddell’s first job as a missionary was as a teacher at an Anglo-Chinese College (grades 1-12) for wealthy Chinese students. He used his athletic experience to train the boys in a number of different sports. One of his many responsibilities was that of superintendent of the Sunday school at Union Church where his father was a pastor. In 1925, at the Scottish Amateur Athletics Association meeting in Glasgow, he set his Scottish championship record of 10.0 seconds in the 100, won the 220-yard contest in 22.2 seconds and won the 440-yard contest in 47.7. He was only the fourth athlete to have won all three sprints at the SAAA, achieving this accomplishment in 1924 and 1925. These were his final races on the British grounds – he pursued his religious duties after this. During his first furlough in 1932, he was ordained as a minister of religion. His first job as a missionary was as a teacher at an Anglo-Chinese College (grades 1–12) for wealthy Chinese students. On his return to China in 1934, he married Florence Mackenzie whose parents were Canadian missionaries in Tientsin. 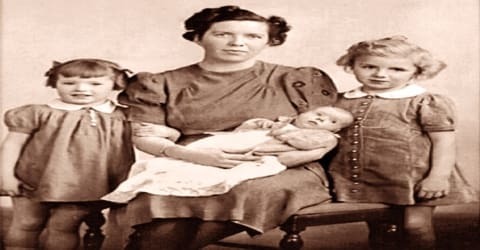 Together they had three daughters, Patricia, Heather, and Maureen. Liddell competed in races intermittently in China. His wins over the French and Japanese Olympic teams in the 200 and 400 meters at South Manchurian Railway celebrations in China (1928) and a victory at North China championship (1930) are worth mentioning. Meanwhile, the Chinese and the Japanese were at war. When the fighting reached Siaochang the Japanese took over the mission station. In 1943, Liddell was interned at the Weihsien Internment Camp where he became a leader at the camp and helped get it organized. Food, medicines, and other supplies ran short at the camp. In 1945, just after his 43rd birthday, he died as a result of a brain tumor, which may have been caused by overwork and malnourishment. Others who were in the same camp testify that Eric Liddell maintained his faith, courage, and kindness towards others until the end in spite of the pain he must have been experiencing. 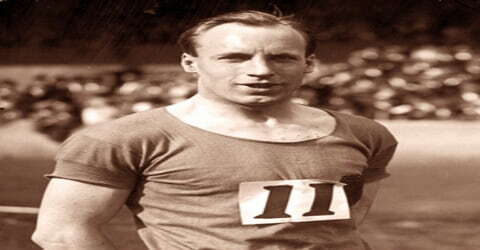 Here is the link for Recollections of Eric Liddell from the Eric Liddell Centre website. In 2012 the University of Edinburgh launched a high-performance sports scholarship named after Liddell. It was announced during a visit by Patricia Russell, Liddell’s oldest daughter. 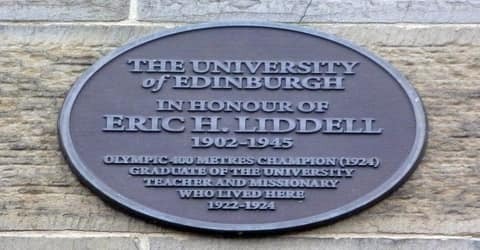 The Eric Liddell Centre was set up in Edinburgh in 1980 to honor Liddell’s beliefs in community service whilst he lived and studied in Edinburgh. Local residents dedicated it to inspiring, empowering, and supporting people of all ages, cultures, and abilities, as an expression of compassionate Christian values. Eric Liddell died in a Japanese camp in 1945, during WWII, in Weishien, China. was buried in the garden behind the Japanese officers’ quarters, his grave marked by a small wooden cross. The site was forgotten until it was rediscovered in 1989, in the grounds of what is now Weifeng Middle School in Shandong Province, north-east China, about six hours’ drive from Beijing. Its rediscovery was largely the result of the determination of Charles Walker, an engineer working in Hong Kong, who felt one of Scotland’s great heroes was in danger of being forgotten. His search for the grave proved difficult because, since Liddell’s death, place names had changed, documents disappeared and witnesses were difficult to find. He is interred in the Mausoleum of Martyrs in Shih Cha Chuang, China. In his last letter to his wife, written on the day he died, Liddell wrote of suffering a nervous breakdown due to overwork. He actually had an inoperable brain tumor; overwork and malnourishment may have hastened his death. 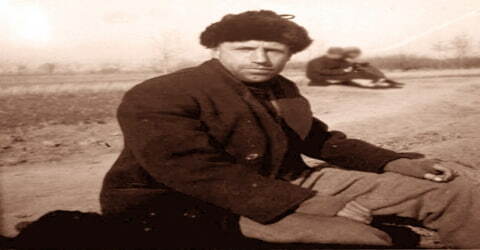 Liddell died on 21 February 1945, five months before liberation. Langdon Gilkey later wrote, “The entire camp, especially its youth, was stunned for days, so great was the vacuum that Eric’s death had left.” According to a fellow missionary, Liddell’s last words were, “It’s complete surrender”, in reference to how he had given his life to God. The 1981 film Chariots of Fire commemorated the Olympic triumphs and contrasted the lives and viewpoints of both Liddell and Harold Abrahams. Eric Liddell ran for the glory of God and Harold Abrahams ran to prove his worth to a society that was anti-Semitic. Actor Ian Charleson portrayed Liddell and Ben Cross, Abrahams. One major historical inaccuracy in the movie surrounds Liddell’s refusal to run in the 100-meters race. The film portrays Liddell as finding out that one of the heats was to be held on a Sunday as he was boarding the boat that would take the British Olympic team across the English Channel on their way to Paris. As noted earlier, the schedule and Liddell’s decision were known well in advance. The scene in the movie where Liddell fell early in a 400-meter race in a Scotland-France dual meet and made up a 20-meter deficit to win the race is, however, historically accurate. Liddell’s unorthodox running style, with his head back and his mouth wide open, is also said to be historically accurate. In 2008, just before the Beijing Olympics, Chinese authorities claimed that Liddell had refused an opportunity to leave the camp, and instead gave his place to a pregnant woman. Apparently, the Japanese and British, with Churchill’s approval, had agreed upon a prisoner exchange. However, none of his friends or those who had lived with him in the camp gave the story any credence. Eltham College’s sports center was named “Eric Liddell Sports Centre” in his memory.